The science behind smiles tells us that it’s one of the most important communicators of positive emotion and it also makes us feel better. Yes, that’s right, smiling makes us feel good every time we do it. Why? Let’s say you experience a positive situation and you see a good friend you haven’t seen for a while. Your brain sends signals from the cortex to the brainstem, from there the craniofacial muscle carries the signal to the smiling muscles in your face. That’s just the beginning, once the smiling muscles in your face contract there is a positive feedback that goes back to your brain and reinforces our feeling of joy and happiness. Smiling stimulates our brain’s reward system, much like exercising or eating our favorite chocolate. Smiling induces happiness, we smile and we feel good. Many of us are reluctant to smile. The reasons behind not smiling vary, but generally involve one or more of the following dental problems: chipped, cracked teeth, unsightly gaps, crooked teeth, severely stained or dark-colored teeth, missing teeth, badly damaged or decayed teeth. The result is the same, due to dental problems you become embarrassed and self conscious and just stop smiling. As an Austin Cosmetic Dentist, one of my top priorities has always been to help people smile and transform how they feel about themselves. Not smiling isn’t an option. At The Cosmetic Dentists of Austin we understand how important it is to smile. We create beautiful, natural looking smiles that will not only look amazing but will also make you happier. You may be surprised to learn that we can correct nearly any smile imperfection, in only two office visits over two weeks. How? At The Cosmetic Dentists of Austin we use our extensive, highly specialized training and years of experience to create amazing smile makeovers. My dental partner Dr. Hay, DDS and I have a combined 40+ years experience in cosmetic dentistry. We have completed thousands of Smile Makeovers during our careers and are both “LVI Dentists” – graduates of the prestigious Las Vegas Institute for Aesthetic Dentistry. 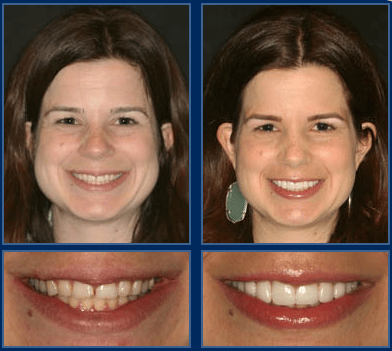 You can see many examples of our Smile Makeovers by visiting our Smile Gallery. An Austin cosmetic dentist knows that the more you smile the better you feel, so call today to schedule a Complimentary Consultation at 512.333.7777 and get started on your new smile!